The CN700 Series thermocouple FM approved high limit controllers provide audible alarm status along with a robust 16 amp relay output. 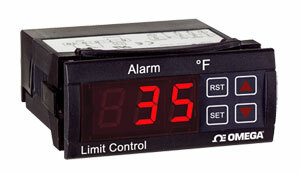 Unit allows the user to easily select automatic or manual reset along with 10 other parameters. The CN700 series has a built in reset button on the front panel or can accept an external reset. The ease of programming and low price make the CN700 series the best value limit control on the market.